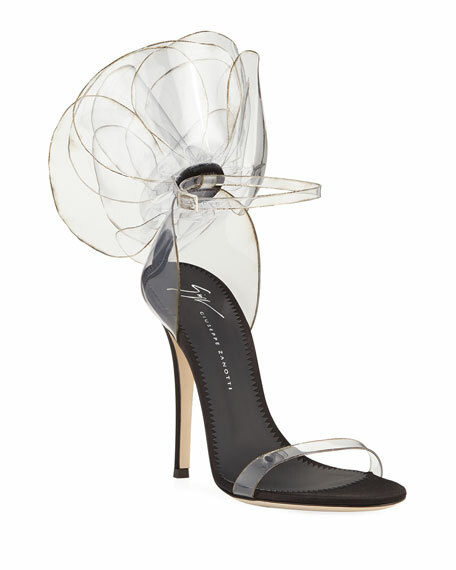 Giuseppe Zanotti satin and see-through vinyl sandal with 3D flower heel accent. Giuseppe Zanotti suede sandal with wings appliqu??. 4.8" covered stiletto heel; 0.5" platform; 4.3" equiv. Open toe. Caged vamp. Double adjustable ankle straps. Lightly padded footbed. Leather lining and sole. "Coline" is made in Italy. Jack Rogers slip-on sandal with leather upper. 0.75" flat stacked heel. Straps over toes and instep; interior stretch-inset. Whipstitching and pinwheels decorate upper. Leather lining and sole. "Lauren" is made in Brazil. 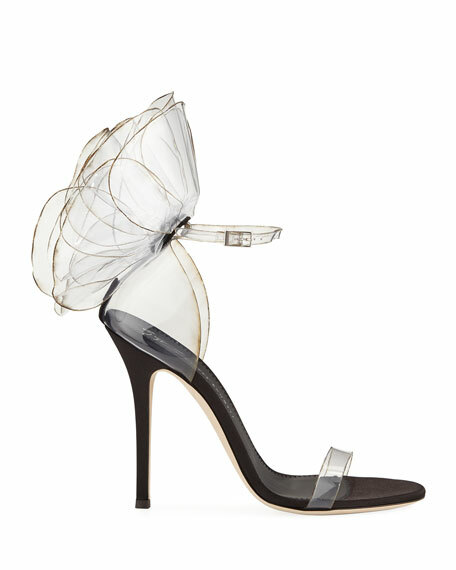 Marc Jacobs calf leather and satin sandals. Part of the Redux Grunge Collection. Speckled chunky platform. Open toe. Buckled two-band upper. Slide style. Molded footbed. Rubber outsole.